The Winter Warfare Mod has a lot of cool new features, many of them are small additions that collate to produce a fantastic combat experience. Imagine, a server with the winter warfare mod installed! You could have huge snow ball fight with all of your friends. Created by the developer ‘Dr Sideburns’ for the Modjam3 competition, which involves creators making a mod in just under 48 hours. There is no real way to use the Winter Warfare Mod you first of all need to download it with Minecraft Forge and then you can load up your latest save game. When loading all of the mods features should be automatically enabled. This mod now adds in different features for blocks of ice. You can break one to get ice balls, and then use nine ice balls to make a block of ice. You can then throw these off other players. You can create rocky and explosive snowballs, simply by surrounding snowballs with cobblestone or TNT. You can create a multitude of snowball launchers. To heal yourself, create some hot chocolate. Next, download the Winter Warfare Mod and drag and drop it into the .minecraft/mods folder of your Minecraft directory. 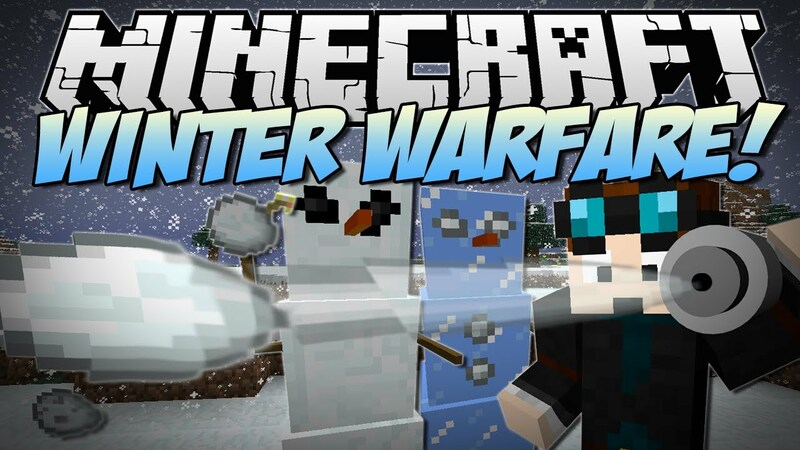 There most recent update for the Winter Warfare Mod added compatibility to Minecraft 1.8.